If you are planning a week’s jaunt or a one day extravaganza we have the capacity to arrange all aspects and surpass all expectations! 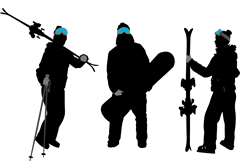 We have many options for corporate ski trips and we know that each event has its own unique needs. For this reason we ensure that every event is tailored to our client’s exact requirements. Having our base in the Espace Killy ensures you a ‘man on the ground' to field questions and make your ideas for a corporate trip a reality. During your event you will be assigned a 24 hour event manager. We have varying levels of accommodation and activities that will maximise all budgets, meaning that your clients/colleagues will have a great experience. We understand slick organisation and swift correspondence is essential. Our dedicated team and management will be on hand at any point to answer questions and ensure your event is seamless. Having worked in all four corners of the globe we have a wealth of knowledge and experience second to none. This experience in the industry is what sets us apart from the rest and have enabled us to managing many highly successful corporate events. We can take care of everything, allowing you and your clients to relax and have a great time. We will transform your vision into reality..